We had a wonderful Bible study today. We read Psalm 100 because there were a number of goals to celebrate. And we studied a client suggested verse: John 3:16. Then, spontaneously four clients shared their amazing testimonies of how they came to know Christ; some quite recently. Thanks to all volunteers, supporters, and the prayer team that made Bible study possible. 1 Earth, sing to the Lord! 2 Be happy as you serve the Lord! Come before him with happy songs! He made us, and we belong to him. We are his people, the sheep he takes care of. 4 Come through the gates to his Temple giving thanks to him. Enter his courtyards with songs of praise. Honor him and bless his name. There is no end to his faithful love. We can trust him forever and ever! Bible Study Can Be Fun? all generations will call me blessed. as He spoke to our fathers, to Abraham and to his seed forever. A reflection from this summer. Last August I was convicted, by a couple of things, that I needed to stop doing ministry alone. First, in a couple of events, I had to give my attention to keeping order and protecting our partner’s building and room; rather than on the needs of a client in trouble. I balanced my duties as best I could, but my client suffered; in that I couldn’t give them the best that I could. Then I listened to several sermons on the Global Leadership Summit on sharing ministry load. The sermons were so compelling that I went home a broken spirit. I was failing to share the load and the ministry was suffering as a result. Fortunately, God pumped me up again, for the second day of the GLS and the message was very encouraging. So, I committed. Right after that, we lost two rooms for our planned indoor events. Remodeling, or simply the message, “it would be better if you met somewhere else”, were the reasons. I tried to find solutions before shutting down the events, but I failed. I talked with every church partner we have and many new ones. After three weeks, I was nowhere. So, we shut down our events and began to wait. In fact, I went away on a retreat to Guatemala. When I returned from the retreat in Guatemala, God had been working on the problem, because we now have offers to use at least 5 rooms in the week. Awesome, or so I thought. However, there were no established volunteers at any of the new times. How hard could it be, I asked myself. I started calling, emailing, and messaging. I committed to finding about 12 helpers for each of the time slots, one for scheduling, and two as co-facilitators to step in on occasion. After several weeks, I was pretty frustrated. I literally have added one available name to the list for the first event I wanted to start; our Bible study on Tuesday from 11am to 1pm. I was tempted to cheat. And God really is sending messages about how many people want our Bible study to start. I got asked every day by clients if I’ve found a place yet. 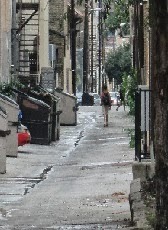 In an alleyway, a young kid called me over to confess his fear of addiction, even as he experiments with hard drugs. Faith isn’t a resource for him, but he told me he would come to a Bible study if I held one. The same day, in that same alley, a young man spoke to me a memorized Islamic prayer and asked me if I would teach him about Christianity. My heart was breaking that we didn’t have our Bible study. I was so tempted to cheat. But that would be cheating our clients. They deserve me and a couple of helpers; so that everyone would get the attention they need. I awoke Wednesday morning realizing that I needed to switch my prayer meeting with other ministry leaders; to that morning. I hurried to get there. The topic that day was praise and thanks. and for the reason that God had already solved our volunteer problems (even if I was frustrated by waiting). At the end of the prayer time, the young minister who had sat next to me, told me that his group had been convicted this year by not having a homeless ministry. And he now plans to work with me to staff our Tuesday Bible study, including the co-leaders, scheduling and helpers! So, I patiently and expectantly wait. In faith. And with great expectation of what it may be like. a Friday job club 11am to 1pm and perhaps even more. God IS good. And the right answers are worth waiting for. Note: we have been successful with starting our Bible study. The street youths asked that we study the Old Testament at the first meeting of our rebooted Bible study. FYI, we meet every Tuesday at 11am at the Congregational Church (greeters to set-up and serve our lunch buffet are ALWAYS needed and welcomed at http://volunteer.StreetYouthMinistry.org/helpers). We recently received a bunch of camouflage jacketed Bibles to give. On the front of the Bible it lists 5 Psalms. The clients noticed this, so we have been studying them. We have come to call them the “Oh-crap! Psalms” because they are wonderful prayers for times of serious trouble. This week, we read and talked through Psalm 46. 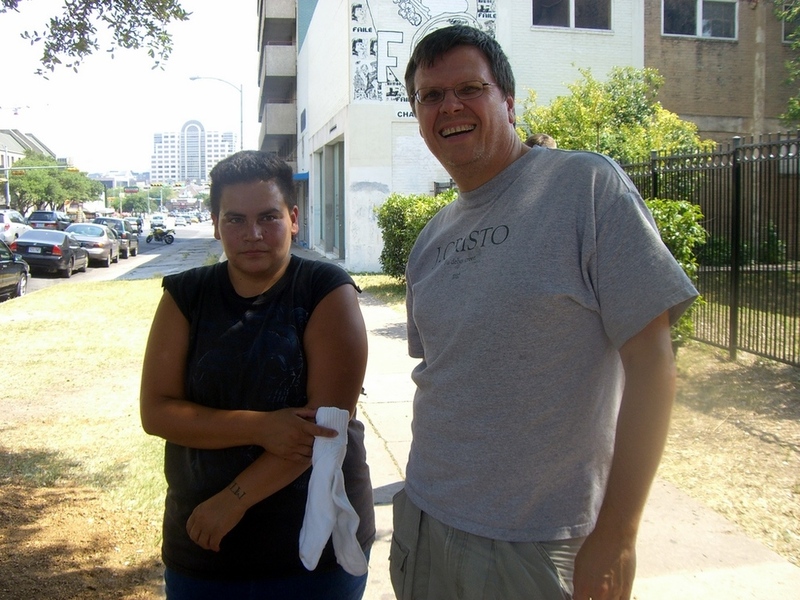 As a way of making sure we understand it, we rewrote it in terms you would hear in the alleys and sidewalks of our mission territory where your young street-dependent client frequents. God uplifts me and is what keeps me going. God reinforces my will power and keeps me out of harms way. He’s not far when I call. I may not know what’s going to happen, but God always sees me through. Everything changes, and I will hold on through the worst ups and downs. I praise God even in the crappiest of times, I will hang in there, it will be alright. Stuff happens, but he can overcome it all. He can do what he wants, he’s that powerful. But he uses his power for good. Take a breath, let God be God. Street Youth Ministry had 19 people walk through the door at our relaunch Bible study. Clients chose the new time, which was best for them, Tuesday from 11am to 1pm. We provided a light meal and a safe place to rest and just be. And, we hosted a number of activities during the time period. Each week we need at least one volunteer; preferably two (unfortunately, if we don’t have at least one volunteer, we have to close the door to the event for that day). Volunteers can sign-up for the Tuesday Bible study helper role at http://volunteer.StreetYouthMinistry.org by clicking on the words near the top “Helpers and Dog Sitters”, or by scrolling down and clicking on the large orange button with the white letters “Helpers” on the left hand side. We plan to offer a Discipleship class on Wednesdays at 2:00pm; as soon as we have sufficient volunteers. That class will be for followers of Jesus, or people who want to be followers of Jesus. But our Bible study will be open to all and will be more to encounter and discuss the Bible; no matter what your faith status. The Bible study group agreed and appreciated our approach. People who are interested in helping with Discipleship on Wednesday at 2pm may record their availability at http://sign-up.StreetYouthMinistry.org. Our Bible study began with an icebreaker. Everyone shared their names and what they wanted to dress up as for Halloween. They had some awesome ideas! After the buffet was served, Terry started the faith portion of our activity. This particular Tuesday, I wanted to begin by asking our group what they wanted to do. I explained that whatever we do was going to be safe for believers, non-believers, believers-of-other-things, and those simply unsure or searching. Shortly after that, a street youth pulled out his own Bible and said he loves Psalm 91 because his grandfather loves it. He began to read Psalm 91. Everyone listened. I asked what does it mean to him. He said it didn’t mean that much to him, but it meant everything to his grandfather; so it meant a lot to him too. His grandfather related to that particular Psalm mostly in terms of his Vietnam War experience. 1. God is powerful. He has your back. 2. Your faithfulness will protect you. 3. 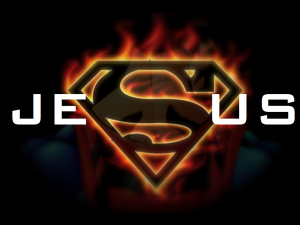 He will save you from the man and from sickness. 4. He will provide a safe alley for protection and retreat. 6. nor MRSA and other wasting diseases. 7. Friends and family may fall, but God will protect you. 1 Happy is he whose resting-place is in the secret of the Lord, and under the shade of the wings of the Most High; 2 Who says of the Lord, He is my safe place and my tower of strength: he is my God, in whom is my hope. 3 He will take you out of the bird-net, and keep you safe from wasting disease. 4 You will be covered by his feathers; under his wings you will be safe: his good faith will be your salvation. 5 You will have no fear of the evil things of the night, or of the arrow in flight by day, 6 Or of the disease which takes men in the dark, or of the destruction which makes waste when the sun is high. 7 You will see a thousand falling by your side, and ten thousand at your right hand; but it will not come near you. 8 Only with your eyes will you see the reward of the evil-doers. 9 Because you have said, I am in the hands of the Lord, the Most High is my safe resting-place; 10 No evil will come on you, and no disease will come near your tent. 11 For he will give you into the care of his angels to keep you wherever you go. 12 In their hands they will keep you up, so that your foot may not be crushed against a stone. 13 You will put your foot on the lion and the snake; the young lion and the great snake will be crushed under your feet. 14 Because he has given me his love, I will take him out of danger: I will put him in a place of honour, because he has kept my name in his heart. 15 When his cry comes up to me, I will give him an answer: I will be with him in trouble; I will make him free from danger and give him honour. 16 With long life will he be rewarded; and I will let him see my salvation. Street Youth Ministry has an intern. That intern has led Bible study as a concluding event of his study with me to better prepare his as a pastoral candidate to help lead the church to work with homeless young people. I am very proud of my student! The group dynamic changes every day in Bible study. Watching the intern explore the dynamic present one particular day reminded me of my first days of starting the Bible study, more than a year ago. He had something planned, and it totally flopped with this group. They just didn’t ever give it a chance. That happens some days to me, too. So he returned to the SYM default plan: read the next Bible chapter and explore it inductively in group discussion. They read aloud the first paragraph of Matthew 23. Then one of the youth began to try to explain the passage. He was well versed in inductive Bible study, Jewish culture of the first century, and really took off. The youth was eloquent and intelligent but also very preachy. Nobody else joined in the conversation, and it was hard to “reel in” the speaker. After a bit, the intern began to express one of the rules that SYM uses: “We just look at what the Bible says. We don’t say what’s right or wrong. That way it’s safe for everyone–Christians, atheists, people of other faith, people of no faith.” That restarted the discussion. This this groundrules reinforced, they began discussing how the church leaders in Jesus’ (and Matthew’s) time were putting big burdens to be perfect on people, putting on big airs, and being very imperfect themselves. And they began discussing their own experiences of the church leaders today: “You’ll let me come here as long as I’m good, but when I need help, you tell me to get out. When I fall down or fall apart, you walk past me. When I admit my faults–and they are some big ones, you shun me.” Tough perceptions from a street youth with poverty, mental health, and other issues. The tension of where their answers started and where they ended caught me by surprise. But later I realized that this tension captures a truth. We are all sinners. Reformed theology tells us that we are rotten to the core. We don’t deserve God’s grace, but God loves us anyway. But, as Christians, when we come together to form the church, we are the body of Christ. The very same individuals who sin every day form the perfect body of Christ at the same time. This is the source of the tension in the street youths’ statements. They experience terrible things from us, but they can also simultaneously see the church as a source of blessing. I believe they experience the church honestly as both a burden of the sinners and a blessing of the body of Christ. Jesus bore the burden. Let us take care not to put burdens on our brothers and sisters. Let us live in love, loving God with all our being and loving one another as Jesus loves us. Amen. 9:00 Daily Bible Reading (at home). I read with a group of folks following a reading schedule. We email one another when we’re done to help keep accountability. The group is described here. Anyone can join the group. http://sites.google.com/site/terrycole002/prophecyreadinggroup. It was founded by a friend of mine. The theme today was God is Faithful. 10:00 Prepared for Bible Teaching on Tuesday. I’m teaching through Matthew 8 this week. The focus will be on the value of faith. I will also help the street youth relate to as many of the people described in Matthew 8 as possible. Some might relate to the leper, the Roman solider, or the demoniacs. (Not that they are any of these, but these men suffer in some of the same ways as many of the street youth.) In addition to reviewing the scriptures and commentaries, I also designed an group session. We will start out by talking about how someone they observed was sick and recovered and how that felt. Then we will share a time we felt really sick ourselves. This will go with the healing theme found in Matthew 8. After the Bible lesson, we will play a memory game with two teams. The game pieces are all items relating to faith. I will ask whoever makes a match to describe someone they know who values whatever the match is. I printed out 15 matching photo pairs with things like prayer, worship, bible… and money, church, running. And we will conclude with a personal time of sharing about the value of faith to them… high, low, strong, weak. How do they take care of their faith? How do they feed it? I printed the lesson plan and emailed it to my helper. Noon: Had a lunch with my wife. It’s one of the benefits of us both working out of the home! I had a meatloaf sandwich made from marked-down ground beef. We try to use money stewarded to us by donors wisely. After my delicious sandwich, I had my big indulgence for the day: my one cup of coffee. I get irritable after more than one cup and it messes with my sleep, so I enjoy my one good made-at-home cup of coffee after lunch. Mmmmmmm… I checked up on FaceBook and email while I enjoyed it. 2:00 Volunteered at the Street Drop-in Center of Lifeworks (located in the basement of a church on the Drag). Actually I’m an adjunct staff member. This was my first day there in a week because I took Spring Break off from Lifeworks. So everyone was happy to see me again and there were some new folks. I screened a couple of new folks for eligibility. I had to turn one away because he was 24 and was able to help the second with the in-take paperwork. I helped him with food and advised him how to get the bus pass he was seeking. I checked in with a couple I counsel… I regularly ask about their stress and anger levels on a scale of 1 to 10. Both were superb… a very welcome change. I also followed up with a couple of people who I knew were thinking of traveling soon. I tried to follow-up with a very young client, but he was not open to my questions. I tried to follow-up with another young man. He let me know that he was having a terrible day and didn’t want to talk. I respected that and let him have his space. A couple of people started physically play-fighting. I broke that up because the drop-in space has to be safe for everyone. No horseplay allowed. I noticed one young man in bad physical shape. I checked in with him to find out why he was hurting. I helped refer him to some medical advice. I signed one young lady up for dental treatment on Monday. I sat with another young girl who was scowling. Turns out she’s on some medication that is really upsetting her stomach. We talked about what options she might have to help this. I found some saltines for her to take away. All in all, I visited with 19 street youth. Three were new to me. 3:45 Drop-in clean-up. Each day we spray down all the furniture with bleach water to kill germs and parasites. We sweep the floor and take out all the trash. 4:00 (outside) I walked the Drag from 26th to 19th street. I found my first group in back of a parking lot near 25th. They were talking about one street youth’s birthday party over the weekend. I wished him happy birthday. I followed up with one of these youth about getting an ID. He lacked an address for receiving some important paperwork so I helped him look at his options. I invited them all to Bible study the next day at 2. I met my next client waiting to cross the light. He’s a very regular Bible reader, but today he was limping. I asked what was the matter and found out that he had gotten a bad foot fungus over the weekend but had begun to treat it. I met a trio from Maryland next. They are new to town so I tried to familiarize them with the rules of downtown Austin (no sitting on sidewalks, no panhandling near ATMs, what aggressive panhandling means). I don’t expect them to follow all the rules, but traveling kids always seem to appreciate someone helping them learn what’s what in a new town. I invited these newcomers to Bible study tomorrow also. The next group I met were begging for spare change (they call it “spanging”) at the corner of an abandoned storefront at 24th. I held an impromptu drug counseling with two of these. They have both expressed being sick and tired of addiction. One is taking action to look for a job. The other is thinking of starting over in a new location. I offered options for getting help to both and suggested that both have to start dealing with the addiction… neither jobs nor a new location will be good unless the addiction get addressed. There is no easy path for either of them. However, they can choose which way to go and how much help they accept. Both were appreciative of our discussions. At the same location, I met a young man who I hadn’t seen for a while. He’d been in jail last week. He was drunk and a little out of control. But he was at least talking with me. He has a very big hurt in his life that he needs to eventually deal with. I asked how he was doing… OK. I asked what he’s up to. “What I’m best at,” meaning taking risks and hurting himself. I prayed for him as I stood with him. I pray for him to come face to face with his trouble either working with me or some other person who can offer support. He’s alone with his hurt now… and it’s so much to carry. I reminded them all that they were welcome at Bible study. The next person I met was one I had seen in the drop-in earlier but who was having such a bad day. He wanted to talk now. I listened to what was bugging him. I was relieved because, even though it was sharply painful for him, it wasn’t severe. We talked about some options he had to relieve what was bugging him. He adopted a plan and set about it. I reminded him about Bible study tomorrow. This continued as I worked my way down to 19th street. In all I met with 26 people this afternoon. That’s a pretty high number. I gave out nothing today while walking. I do that on Fridays. While it would be wonderful to give stuff out every day, I’ve got a couple of issue with it. First, I’m not buying their relationship and I want them to know that. Second, it takes a lot of time to manage all the material, moving it from donations to storage to loading it and giving it out. I reserve that for Tuesdays and Fridays. 6:30 Dinner with the family. First day back from Spring Break was good for everyone. 7:30 Responding to emails. A new monthly donor needs to be thanked for letting me know a regular check will be going to Covenant to support my family and ministry. I edited my web site because I noticed some horrible mistakes on the donation drop-off site page. I responded to a donor who wants to drop-off a needed boom-box and to help proofread future publications. I sent thank you notes and photos to the sandwich providers from last week. I uploaded photos from my camera that will be used for an upcoming blog. 8:00 Updated my records for last week. I write down the names of everyone I visit with each day. This helps me learn their names and serves as something I can pray through in spare moments. I enter the records each week into a spreadsheet that updates my web page graphs at http://sites.google.com/site/streetyouth/who-we-serve/some-numbers. So far this year, I’ve met 154 new kids and reconnected with 58. I’ve had 1605 contacts so far this year with new and old clients: 143 for witnessing, 28 for crisis intervention, 71 for counselling, and 422 for follow-up discussions. 8:30: Created a welcome email for all those people new to our mailing lists but who haven’t yet received a newsletter. I haven’t sent a newsletter since January, thinking everyone heard quite enough from me in November and December! However, it’s important to keep people aware of FaceBook, the web page with sign-ups, ministry needs, donation methods, etc. I am told over and over again that it is impossible to over-communicate to busy people! The email should be waiting in the in boxes tomorrow morning of the 120 people who are new to Street Youth Ministry volunteer, newsletter, and donor lists since early December 2009. 9:00 Wrote and edited this blog entry. This week I am taking off most of the week for self care. I have been feeling tired recently. I realize that I haven’t taken any time off in a long time. I took a week off for Christmas and I had a week long vacation last July. So I heeded the instinct to slow down a bit this week. I have been keeping careful enough records of my direct service time to make a graph of my hours. Since January (and really since last September), I have been doing 20 hours of direct service per week. The rest of the time goes into preparation, administration, study, community speaking, and other forms of marketing (to potential clients, networking partners, and financial donors). However, this June I made changes and added more direct service time. My average weekly hours went up to 25 hours a week. This may not sound like much but it definitely has taken a toll on me. So I’m going to have to do some soul searching and cut back down. Eventually I may be able to handle this load when I’m full funded since maintaining the financial donors takes less work than securing them all. However, after 5 months of fund raising work, we’re receiving 40% of what we need. I still need about 50 more donors so I’ll be doing fundraising at least through the end of 2009. In those 20 hours of direct service, I typically see 70 different people in 120 different conversations. Most are brief follow-up, some are longer, and about 20 per week are in depth. Each week I meet about 10 new people on the street. So how does one do good self care? I think it’s one of the most important keys to working in this field… second only to the ability to have compassion for others. I have been privileged to learn from people who really care about me and care for themselves. First in importance is to be in prayer and study of the Word. I do this in several ways. My ministry partners help hold me accountable for prayer before ministry. And record keeping also helps me remember to pray for individuals. I am kept in the word by a bible study group. You can join it, too. It’s described at http://pages.google.com/edit/terry.cole/prophecyreadinggroup. By holding my feet to the fire daily to be reading the Bible, I gain enormous strength and refreshment. I also listen to KNLE http://www.candle88.com while driving to and from work. (And yes… I give them a portion of my tithe, too! They need more!) They play lots of Christians songs which help center me on my work. Second, you pay attention to your feelings and act early. I was feeling tied so they encouraged me to take time off. You have to be self-aware of your own feelings even as you work with others on their feelings and issues. One of the best ways to do this is to have a regular meeting with someone once a week to check-in with them. Hopefully they will ask, “So how are you feeling about your work this week?” It’s not a yes/no or good/bad question. It’s a question that needs some comparative adjectives… better than last week, more tired than last week, really centered compared to a couple of weeks ago. Third, you set and hold boundaries for yourself. You can’t be more invested in an outcome than a client is. While we are there to encourage them, we really can’t make them want anything. We can offer options for solution and they have to make all the choices. You also can’t solve all of a clients problems. This is really hard, but you can only go down a list of things that you know how to do. Once you have, you (and hopefully the client) have to accept that you’ve done all there is to do. There’s a Linda Martin song about this… “What do you do when you’ve come to the end… You just stand.” As someone who sees 70 homeless people a week, I have other boundaries that may not be needed for the average person: I don’t give out money, I don’t take people places, I don’t bring people home to sleep in the garage or couch, and I don’t go buy people new items that they request. The issue with any of these is the same: which of the 70 people would I choose to start? and where would it end? I’m not saying any of these things are bad, and in fact I praise the Lord that there are people who have the ability to take in one or two people at a time and do so regularly. However, I recognize that I am not positioned to do this. And I limit what I give away to those things which can be purchased on my very meager ministry budget and which can be donated by many very many Christian supporters. I want to give my homeless youth everything that I can, but it needs to be given through loving hands and not simply a credit card. And these boundaries keep me able to love and able to continue my ministry because I have taken care of my biblical requirements to be a good provider and head of my own household. You will be temped to violate your boundaries from time to time. I have done it, but I heartily recommend checking with a friend before violating them. It is far to easy to rationalize yourself into doing something you should not. A friend can really help figure out if what you are doing in an exception or the first step to disaster for your personal self care. Forth, you have to spend time time processing what you have done. I think it’s extremely helpful to write down some stories. Or you could simply meet once a week and tell some stories to a friend. Often we cannot see the forest for the trees. This happens two ways for me. First, sometimes I fail to see the big picture for a specific person because we’re so busy working on little details. It’s only later that I realize that this client has really made a ton of progress, e.g., because of how they are approaching the situation compared to a month ago. And it also happens across multiple clients. You can be so busy with each client that it only dawns on you in reflection that you’ve been helping 8 different clients with drug counselling and that 6 of them are making progress even though they’re in different stages. Reflection takes time and discipline, but it’s definitely part of self care. I find that record keeping helps me take the time. By keeping sufficient records that I can count the interactions and name the type of interactions I’ve had with clients during the week, that I also have sufficient raw material in reflections to realize where my ministry is. Fifth, you have to enrich yourself constantly. Enrichment comes in many forms. You can read what others are doing to pick out new best practices. You can get certified to do something new. And you can take time to practice and hone new skills so they become easy and second nature. In my ministry, I always read descriptions of services for street youth with interest. I want to know what is being done out there in the world so I can copy the best of the best. I also try to get classes, continuing education and certification on new things. I became a voter registrar to I can help people with a secondary ID. I became a notary public so I can help those who support me with a useful service. I became a certified food handler so I could be sure I knew how to handle foods given out safely. And I am always looking around at what gets done for homeless, and asking myself if I could learn to do that. If the answer is yes, then I get mentored, start practicing, and then start doing it. An example is filing out certain forms. This usually means passing the client to someone who is qualified, but this is disconcerting to the client. So if I can become qualified and practice so that I can do it well, then I can be of better help to the clients. Another example, if dealing with specific situations. Unless you have benefit of a mentor or a book, you are going to learn how to handle such situations one person at a time. But by referencing an expert, you can grow much faster. However, it still takes practice to master. Finally, you need to find new inspiration from time to time. I thrive on being around passionate people and on hearing great stories. So I go once a year to something called the Leadership Summit. I know I will hear from 10 great leaders in the country from churches, academics, and business. And I know I will hear amazing and inspiring stores for two solid days. I walk away totally energized and totally ready to face another year! So whatever you do, be sure to exercise good self care! I held my first street based Bible fellowship last week. It went very well. Four street dependent folks sat with me in the air-conditioned comfort of a church on Guadalupe Street (not my home church, so I really appreciate them opening up their doors for this missionary). They listened about the history of the Bible. They read aloud and discussed the first chapter of Mark. They raised questions like “do you really need to be baptized to go to heaven” and “how much does Jesus know about temptation.” Great questions. This went on for two hours of fellowship! Later that week, I saw one young man who was there reading a New Testament. That was a new sight for me! Wow! And at the end of the week, one man, Jesse, came to me and said he plans to participate this coming week. But first, Jesse had a question. Some of his “friends” have blasphemed God in the past, and Jesse needed to know if God really meant they couldn’t go to heaven now. You see, his “friends” had gotten mad at God and cussed him. “They” had called him names and walked away from God. “They” had had nothing to do with God or Jesus for quite a while. But now “they” were sorry, but could they be forgiven. “Had they blasphemed?” he asked me very urgently. I told him that clearly his “friends” had separated themselves from God when they had turned their back on him, cussed him, and called him names. God still loves us; however, we know that God is unchanging. As long as we remain with our back turned, he cannot accept us. However, when we humbly come back to God–turning around and repenting–it’s in God’s nature to love us, accept us, and take us back. God is unchanging in both cases. It is us who changes. So, I told Jesse that his “friends” needed to turn back to God, needed to tell God and Jesus they were sorry, and needed to stay focused on God. I told Jesse that his “friends” needn’t worry about being unforgivable because of one utterance. The Bible tells us that to have blasphemed, to be blaspheming, and to continue to blaspheme is unforgivable. It seem naturally so, because in this state we are faced away from God and there is no way for us to ask for or receive God’s forgiveness. However, when we turn back to God humbly and ask forgiveness, his grace is there. So, Jesse… Yes! Your “friends” can come home again. They are still beloved children of God. Jesus wants them to be his brothers, to bear with them, and to love and serve with them. Come on home! We’ll throw a party!